Technology and people are ready for a great leap in the music industry to refuse from hard work producing and performing electronic dance music. 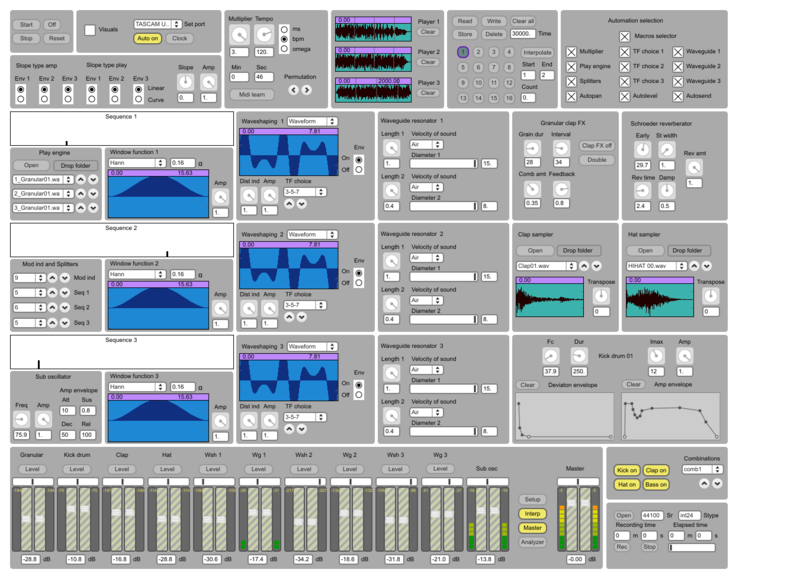 The algorithmic composition instrument Compositor made available the opportunity to enhance a new way of living, where most of the work done automatically, not by a human being. The artificial intelligence of Compositor software made available the highest standard in techno music generation. 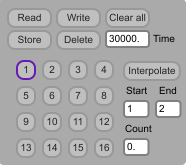 You can turn the Auto on button on and store rhythmic and tonal structures on the fly using the available snapshots. The whole idea of algorithmic performance came to us with the beliefs that humanity must be free from hard work process. Now the only need is to control parameters of real-time performance such as effects and rhythmic instrument occurrences. All the main parameters of Compositor software arranged in a one user-friendly look. You can find snapshots and preset management, main sound synthesis routines, tempo and rhythm controls all placed in a logical and intuitive manner of a Modular style system. The modules were carefully selected during more than 10-year practice in sound synthesis technics and work with hardware rhythm machines and synthesizers. You can find most parameters by reading modules placement from left to right. Visual indication comes first if you want to know more about system performance and here you will easily find sequence steps, while looking on mixer levels, which they produce. Compositor is the bottom-up approach synthesis and rhythm generation system. 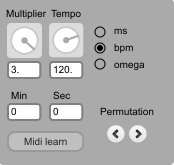 It uses only one parameter called Multiplier to change sequence structure and tonal content of the mix. By operating a multiplier dial, you can dramatically change your performance. While moving this dial you also change the fundamental frequency of your kick drum and bass sounds, which is crucial for real-time generation of new tracks. Multiplier can be seen as a solution for most of the parameter changes and defines a reference base for subsequent synthesis routines. The waveguides tuning is an art of an organ master. When you play with MDL12 you have all predefined, but in Compositor Pro v2 you are an engineer of new life. A new life of music. The creativity varies in its forms and creators capture the most successful approaches. Compositor is the only software, which emulates real human being behaviour of techno music production and performance. Its artificial intelligence includes recursive approach to real life interaction with audience. The cutest thing about Stochastic (random) parameter selection is that this system allows not only controlling various aspects of your live performance but there is a possibility to predict stochastic events occurrence. It is based on specially designed Prediction algorithm and can successfully count time intervals between performance switches. In fact, it gives you control over decision-making process to perform any special effect or arrangement move during the track playback. Compositor operates by using the mathematic function to define its output. Function was formulated by founder while studying the relevance of rhythmic structure on spectral content of the mix. It is derived from FM synthesis and uses frequency modulation as a starting point for building up the final sound of the mix. Every performance parameter takes its routes from this function and manipulated by stochastic representation of Probability density functions. The Snapshots system brings to you the possibility to store each generated Track in one of the sixteenth slots. You can listen how automated system switches the parameters and decide whether you like it or not. Than just store a snapshot. After you successfully stored your presets, you can switch between them and enjoy the tracks, which you like most. This is a lifesaver during the Live performance, because if the public likes what they hear, you can store a track just by pressing one button. Than it’s up to you how to arrange the track but remember the rule that any captured moment lives in our memory. New Redesigned mixer shows the complete information about the audio signal. You can visualize your fader dB value, while watching Peak level meters. 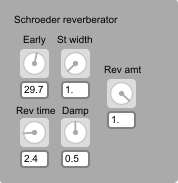 You can send the audio to Schroeder reverberator effect to achieve different room or hall style spaces. The effect can be achieved Pre-fader or Post-fader for full control over the spatial feeling. The Compositor instrument has midi-learn built in. By pressing Midi-learn button and successively touch-and-assign your controls you can achieve full control over the software parameters. You can easily use as much controller interfaces as you need, just assign them to different midi channels. In fact, together with automated parameter changes it gives you unbelievable experience of synthesizing Techno music live. 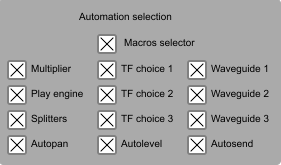 Compositor parameters automation system uses linear congruency generators with 2^31 possible variants. They are shaped in different Probability density functions and you will never achieve the same setting twice in 2147483647 period. This is enough to convince our memory that no track can be generated twice during one live performance. Compositor has endless possibilities for experiencing a new mix any time you play live. Compositor Pro 2 is the real-time groovebox and synthesizer, which helps to establish a live performance using minimalist setup. The Techno music is one of the most inspiring electronic dance music genres. It is a field of experimentation with rhythm and sound synthesis. Compositor not only defines the genre, its scientific part discovers the purpose of modern rhythmic structures. You can visualize this by using 3d Visuals, which main purpose is to provide visual feedback of the instrument work. Compositor uses Non-linear distortion and Physical modelling to enhance the sound of pure harmonics derived from FM synthesis. Compositor output is aliasing-free and has no dc-offset on any channel. The sample pack, which originally produced for Compositor version one, extended with new Clap and Snare samples. In this sample pack you can also find new Granular engine samples, which were synthesized using different technics and have the same average level for consistent output. Windows Vista, 7, 8; Mac Intel machine running OS X 10.5 or later; an OpenGL-compatible graphics card, OpenGL 1.4 or later. For bugs report e-mail to info@compositorsoftware.com stating the issue and a way to reproduce it.